This is another Pushkin title that shouldn’t be missed. 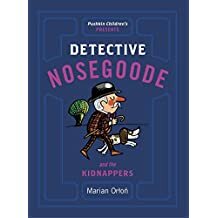 This story of a retired policeman and his dog investigating a theft of a rather special music box. It is charming and beautifully illustrated by Jerzy Flisak. Detective Nosegoode spends his days playing the flute, and growing radishes. (I’d love to know why he grows radishes. A most peculiar vegetable to grow, I always find them to be too bitter.) He reads the paper to his dog, with whom he discusses the news. Cody is a rather unique dog. When the music box disappears Cody has his own views about what has happened and the strange man in the village, with the fake moustache and the poison bottle. I wanted to illustrate this with a picture of Blackbeard, however, I can’t find a source on the internet. Trust me – it is a wonderful picture. As is the one of the poison bottle. A book about bravery. Theft. Doing what is right. Poison, treasure and temptation. As always with Pushkin the design of the book is up to their usual high standard. Lovely paper with nice red, thick card covers. These have the French fold and are as a consequence a little more sturdy, and look more professional. It is set in c. 12 point, I think – though this might be wrong. It is beautifully set in what my Dad refers to as black! Beautifully clear and ‘set’. Though I suppose that phrase is a little redundant now-a-days. The illustrations are bold and give the impression of lino cuts – though this might be inaccurate. This is a super little book. 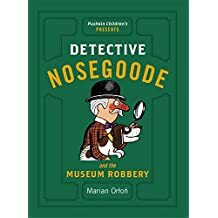 Detective Nosegoode and the Kidnappers & Detective Nosegoode and the Museum Robbery.